This piece has long been one of my favourites. I have been playing and performing it for many years and always find it optimistic and uplifting. This particular performance was unplanned, I was actually being filmed with a band for a future project (watch this space...) when the director, Oliver Hill, (my eldest son!) insisted we film a solo piece. I'm delighted he did. The guitar is actually a flamenco guitar made in 1963 by Manuel Reyes. I am delighted to announce the release of, The Robin Hill Quartet's recording of Claude Bolling's Concerto for Classic Guitar & Jazz Piano Trio. You can find it on iTunes, Amazon UK, Amazon USA, CD Baby, and wherever you normally buy your music! Recent review: 5* "Simply amazing. Sheer musical quality from Robin Hill and his trio. I would urge all of you to purchase this and listen to one of the worlds greatest guitarists have fun!" Verified Purchase - Andrew Wright. This is a unique piece allowing the classical guitar to be heard in unfamiliar company. The chief protagonists are the guitar and the piano who partake in a fascinating dialogue throughout the seven movements. To hear the classical guitar in this company is refreshing and exciting. I should know, as I have performed the piece many times live, and audiences love it. One of the most difficult challenges in performing this work is finding the right players. I've been lucky enough to manage this twice! Firstly with Eklectica and secondly, this current recording with the Robin Hill Quartet. The guitar's role is primarily, but not exclusively, in classical style. For example, the opening movement requires technical precision allied with a classical approach but the 'Africaine' begs for a laid-back jazz groove. The piano's role is both as an improvising jazz voice combined with the discipline of more classical writing. Thus it is very challenging to find a pianist who is comfortable in both camps. Stephen J. Wood fits the bill perfectly. The percussion part is equally demanding and I have never heard it played better, or more effectively than by Maurice Cheetham. He combines energy, accuracy and groove with the needle-sharp articulation of a classical percussionist. Dave Lynane supplies the essential jazz feel plus a significant contribution to the ensemble sound. The timbre of his double bass compliments the classical guitar beautifully. "This was the first performance by the quartet, consisting of Steve Wood, (Keyboards), Dave Lynane (Bass), Maurice Cheetham (drums) and Robin Hill (Classical Guitar). Of course, Robin Hill's reputation as a guitarist par excellence preceded him, but the quartet was an unknown quantity. The second half was taken up entirely by Claude Bolling's seven-movement Concerto for Guitar and Jazz Trio. I am firmly convinced that it is only the unusual line up that has stopped this piece being played more often. It was melodic, firmly entrenched in jazz, and contained a heady mixture of classical, Latin American and other styles too. I was left with the impression of a piece one must simply hear again. The playing throughout was impeccable. It was very demanding on them all and, for a first performance by the band, we had all experienced something remarkable." 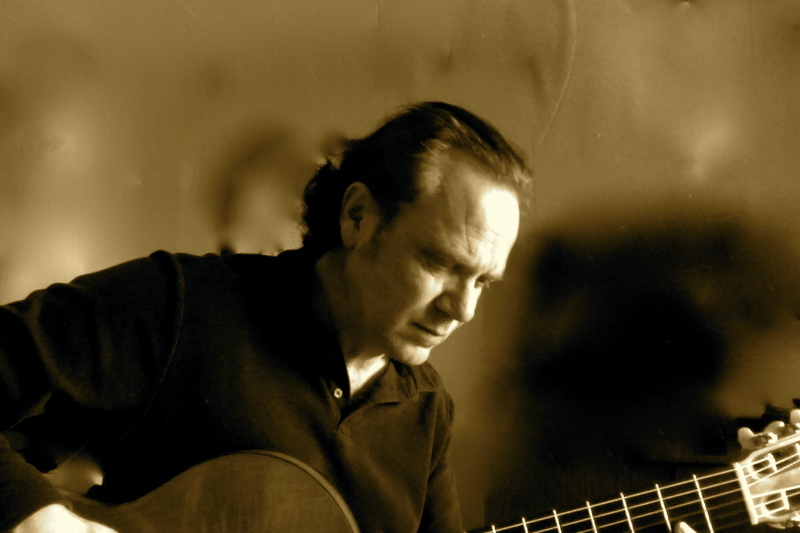 Chris Dumigan - Classical Guitar. Available from: iTunes, Amazon UK, Amazon USA, CD Baby and all digital outlets. Recently he has been extremely busy preparing many pieces for download with one simple click. There are now nearly 60 such pieces available from Sheet Music Plus, for a variety of instruments. The majority are guitar based, either solo or duo, but there are also arrangements for guitar and voice, flute and guitar, string quartet, piano and many more! Many of the pieces are original compositions, such as, 'Return to Islay', or, 'Canzone', both for solo guitar, but also original compositions for guitar duos such as, 'Esercizio No.1 'Tarantella' for two guitars'. For those with an interest in flamenco guitar you could try, 'Fiesta de Xabia' which is a fiery and lively piece. However, there are also piano pieces, 'Joydance' being one. Arranging music has played a huge role in Robin's life as a musician and he has always spent a great deal of time arranging, performing and recording the pieces of historical giants within the world of classical music. Some examples are, 'Prelude No 1 from The Well-Tempered Clavier, J.S.Bach, 'Sonata L.483 for solo guitar', Domenico Scarlatti, 'Rigaudon (arranged for two guitars)', Georg Frederic Handel, 'Escorregando (arranged for flute & Guitar)', Ernesto Nazareth, 'Pavane (Op.50 arranged for two guitars)', Gabriel Faure, and many, many more! Traditional music, whether, Irish, or Christmas, can also be found. There are too many pieces to mention individually here, but please feel free to have a look around on Sheet Music Plus and check back frequently as new compositions and arrangements are being added all the time. If you feel a few Skype lessons could help get your fingers around some of the trickier pieces, well, just send me a message, and if there's any requests for a particular piece, well, you only have to ask.